Malcolm X kidding around with Muhammad Ali, New York, 1963. 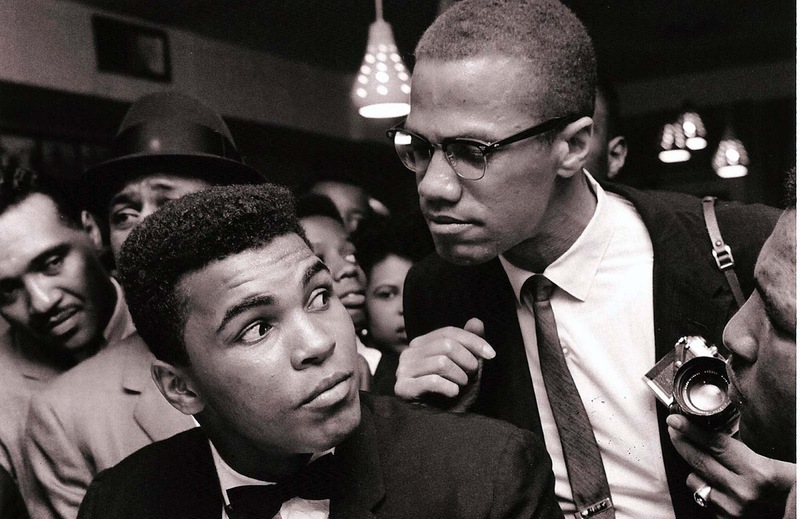 Muhammad Ali became a close associate to Malcolm X and he looked to Malcolm much as a mentor. They knew each other as active members of the Nation of Islam until Malcolm X left the group in 1964 and was killed in 1965. Ali didn’t leave the group until 1975. 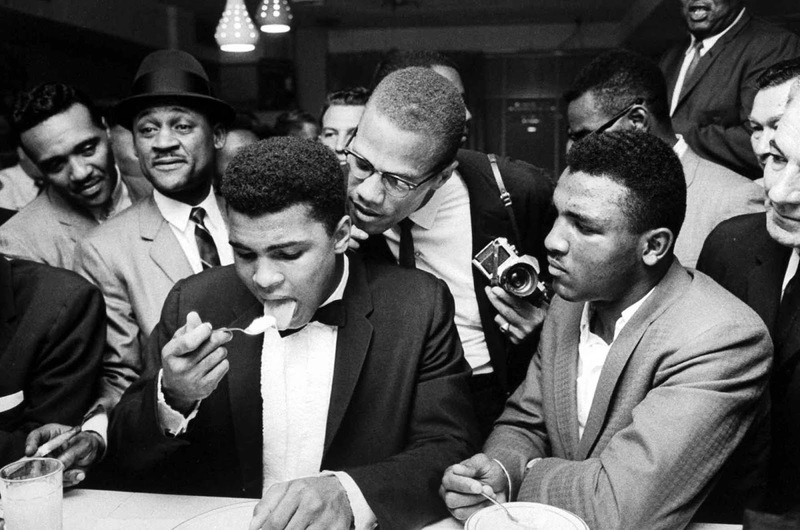 Ali and Malcolm were really good friends, however, they did become estranged once Malcolm X had his falling out with Elijah Muhammad and Ali was still associated with Elijah. “Turning my back on Malcolm”, wrote Ali in his 2004 autobiography The Soul of a Butterfly, “was one of the mistakes that I regret most in my life. I wish I’d been able to tell Malcolm I was sorry, that he was right about so many things. But he was killed before I got the chance”. There would be no reconciliation between the boxer and the man who recruited him into the Nation of Islam, who was beside him on the day the newly crowned 22-year-old heavyweight champion of the world announced that he had rejected Cassius Clay as his “slave name”. By February 1964, when Ali announced his name change the day after becoming world champion, Malcolm X was growing increasingly disillusioned with Elijah Muhammad, the prophet leader of the black separatist Nation of Islam movement. On February 21, 1965 Malcolm X was assassinated as he gave a speech at the Audubon Ballroom in Harlem. Elijah Muhammad, Malcolm X insisted, was in fact so ignorant of Islam that he didn’t know the prayer ritual. And when he claimed that Muhammad was a hypocritical womanizer who had fathered children through affairs with his secretaries, Malcolm X was frozen out of the Nation of Islam. He wanted Ali to come with him. But the young champion was to disappoint him. “Malcolm and I were so close and had been through so much”, wrote Ali in his autobiography, “But there were many things for me to consider. Malcolm X was a great thinker and an even greater friend,” wrote Ali. “I might never have become a Muslim if it hadn’t been for Malcolm. If I could go back and do it all over again, I would never have turned my back on him”.